It seems my common blackbird photos category starts to grow. 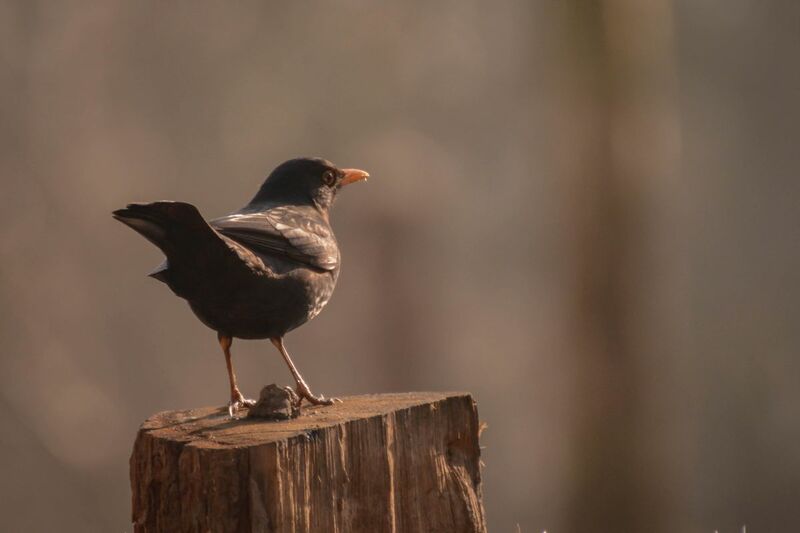 Common blackbirds are easy to find here in Germany, and that means they are a perfect target to practice bird photography. I shot the photo in this post some weeks ago, the sunlight was not too strong, but there was decent sunlight, and I like days where it’s not too bright and not too dark. The photo was shot with my Tamron 70-300mm lens, but I cropped the image to get a little bit closer to the bird. I tried the rule of thirds composition and flipped the image horizontally, because for some reason it looked better to have the bird looking from the left to the right and not the other way around, but I really can’t explain why I think that. While I am happy with the Tamron lens, I sometimes get the impression that the images could be a bit sharper, even if I cropped the image. Anyway, I am not unhappy, I use this lens a lot now, it allows me to take more bird photos. Quite a pose there, bird. Well done – you caught this one with the lovely curves and flip of tail.